Cooking a gourmet meal — not to mention eating it — in your outdoor living space is the dream for many homeowners. The best outdoor kitchen designs create a comfortable, convenient, and downright gorgeous space that you’ll enjoy using for years and years to come. Some of our outdoor kitchen ideas boast a grand, five-star restaurant feel — while others possess a home-style barbecue charm. 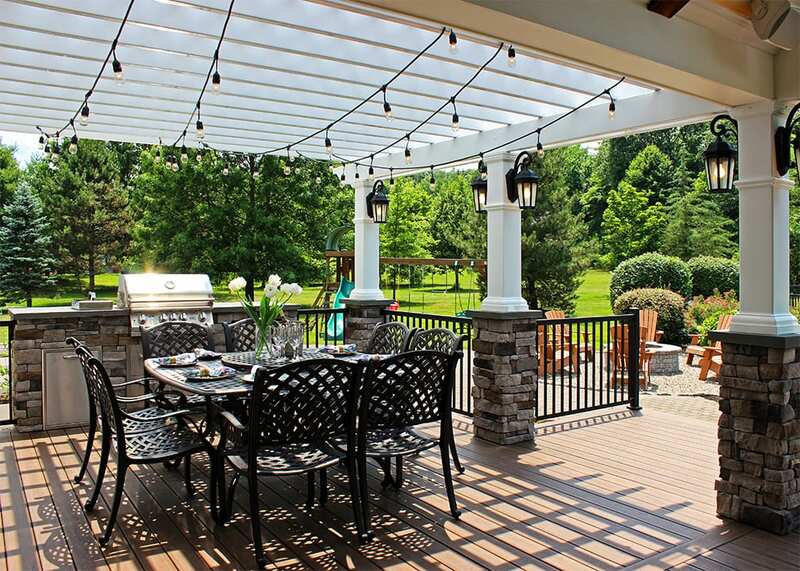 Like with all Keystone outdoor living concepts, our outdoor kitchen designs express the homeowner’s personal style, all while enhancing the other uses of the space. Discover the unique Keystone design philosophy — and explore some of our outdoor kitchen designs! 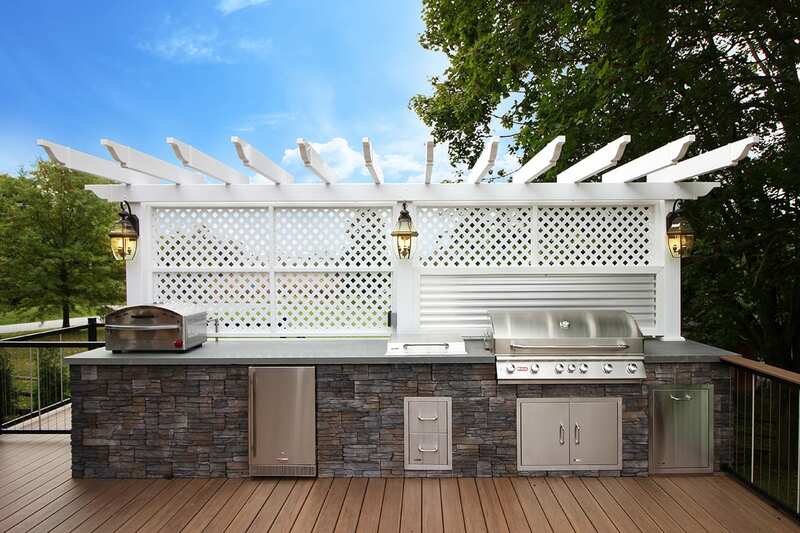 Once upon a time, plopping a grill onto your deck was considered a top-of-the-line outdoor kitchen — how far we’ve come! Now we can incorporate outdoor kitchen ideas that are as fully-realized as any indoor gourmet kitchen and as ambitious as any other stunning outdoor living space. An outdoor kitchen can absolutely be as well-equipped as an indoor kitchen. Your options outside can be as endless as your ones inside. We’ve created outdoor kitchen designs complete with almost any and every kitchen accessory on the market. Observe this fully-stocked large outdoor kitchen we recently built. Shaded by a vinyl deck pergola, this elaborate cooking station includes a side burner, a pizza oven, an outdoor pantry and more. Simply put, the more you love to cook, the more you’ll love to cook outside, and we can design the perfect outdoor kitchen for you. 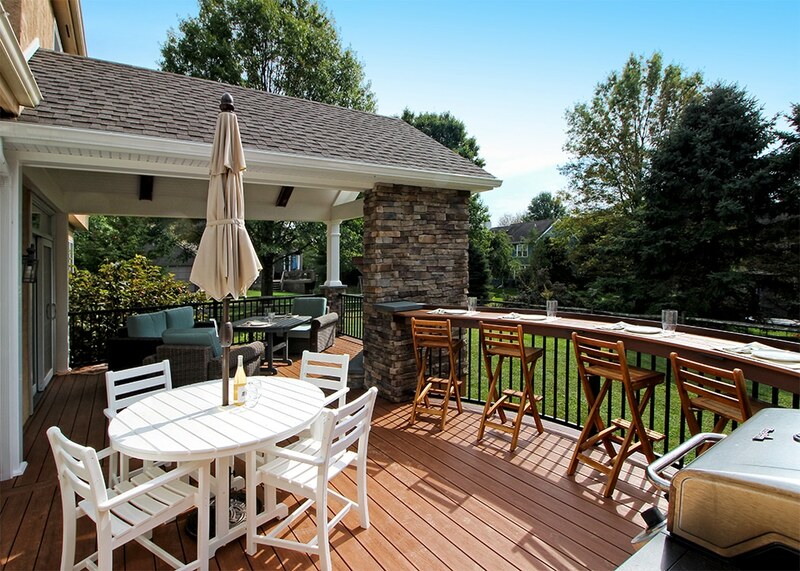 While you may be fond of your outdoor kitchen, it doesn’t need to occupy the entire deck. 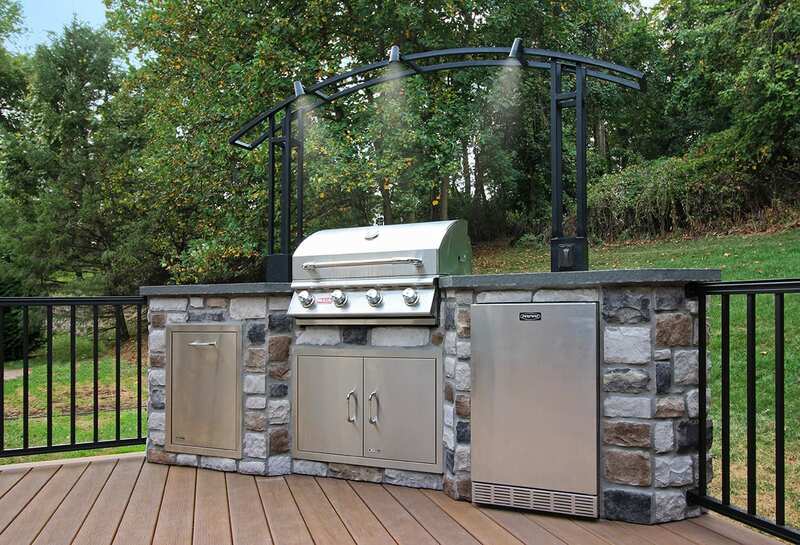 Placing your outdoor kitchen in the correct place in your design is a careful balancing act — one that the designers at Keystone Custom Decks are very familiar with. For example, an outdoor kitchen design shouldn’t feature the cooking station in the middle of the deck in a way that could impede the flow — but it also doesn’t exile it either. From a practical standpoint, you want your outdoor kitchen close to both the door to the house and the seating, which makes cooking as convenient as possible. Notice how this gorgeous outdoor kitchen places the kitchen in a central yet unobtrusive position. This allows for the ease of cooking and socializing. At heart, a deck is meant to be a social space. To that end, an incredibly popular outdoor kitchen idea involves adding a separate seating area near the cooking space. This addition allows someone to grab a seat and keep the cook company. Bar seating is very easy to add to the grill station and is featured alongside many outdoor kitchens we’ve designed. See how the bar and bar seating accompanies the grill station. This elevated sitting area offers another way to enjoy the space — whether or not someone is cooking. To some people, luxury means having absolutely EVERYTHING. At Keystone Custom Decks, we often create outdoor kitchen designs that are tailored to what the homeowners will actually use. Oftentimes, great outdoor kitchen designs do more with less, focusing on what the homeowner truly needs — and expressing their personal tastes. However, if you know that you’ll truly use every facet of your decked-out kitchen, we’re more than happy to bring any dream outdoor kitchen to life. Learn more about other outdoor living accessories. A final hallmark of great outdoor kitchen designs is maintaining a sense of balance across the entire outdoor living space. A balanced design is both a practical and a stylistic boon. Whether the outdoor space is modest or extravagant, you can enjoy the benefits of balance. 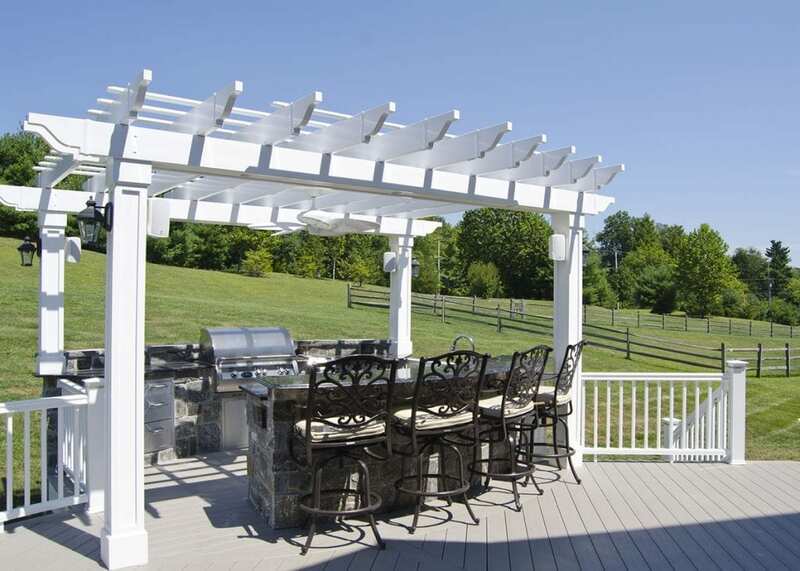 In this busy outdoor space, the covered gazebo deftly balances the pergola and cooking area. 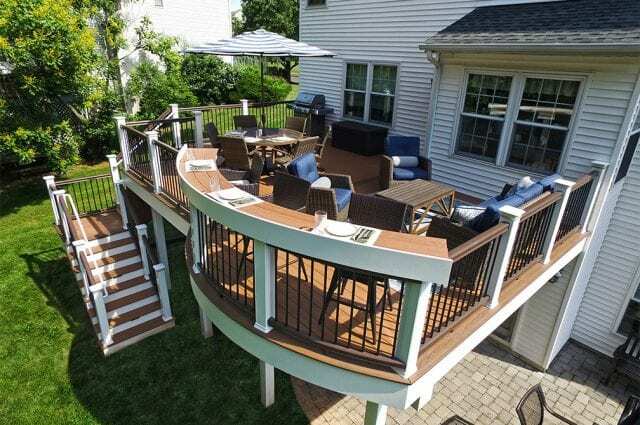 In addition, both areas are equally usable as social spaces on opposite sides of the deck. While this project is much smaller it equally demonstrates a balanced design complete with a prominent outdoor kitchen. In addition, the stonework backing of the outdoor kitchen mirrors the stonework of the sitting area fireplace. 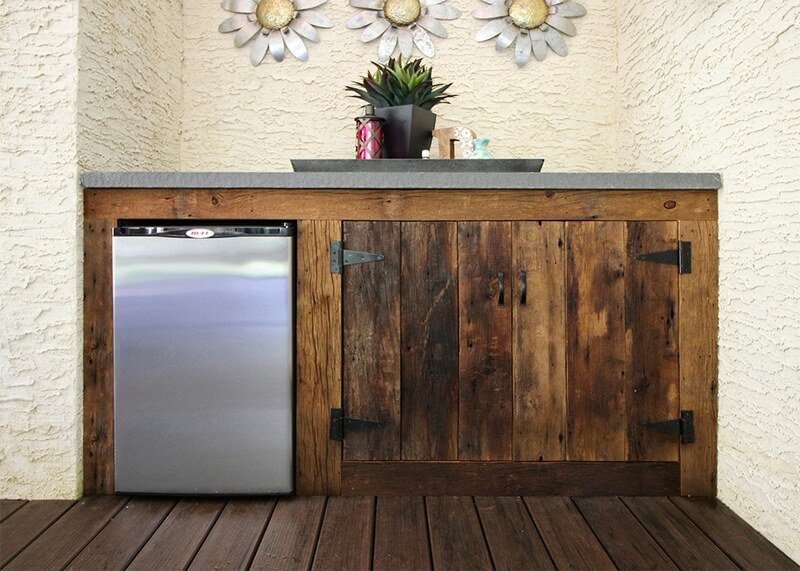 Inspired for your dream outdoor kitchen design? Fantastic. At Keystone Custom Decks, we can build your dream outdoor living space complete with all of your most ambitious outdoor kitchen ideas. Every single one of these gorgeous projects was born from a conversation between the designers of Keystone Custom Decks and a homeowner with a great idea.